So often, people truly want to find a way to get in shape, and exercise daily, but they can't afford a long-term gym membership, don't have time to drive to a gym, or their schedule won't allow them to get to a gym on time. At those times, they often start to think about getting a home gym, and are almost immediately turned off by huge prices, equally huge gym systems that will take up entire rooms if they fit at all, and just get discouraged. The Powerline BSG10X Home Gym will help solve those problems for anyone who wants to get started exercising at home. When you get your Powerline BSG10X Home Gym set up, start out slowly, and work up the time you spend on the gym each week to three times a week for a longer period of time at each session so you do not overdo it. Using a home gym is the best way to ensure you will take the time and get your regular exercise in. You don't have to fight traffic or make it to the gym on time. Another bonus for beginners is the simplicity of use. The Powerline BSG10X is a very straightforward machine, with no complicated switches and cable changes required to switch between body zones. You can assemble the Powerline BSG10X Home Gym, Short Assembly, 160lb weight stack unit right out of the box in under 2 hours in most cases. It is very well constructed and almost completely assembled upon delivery. Just take it out of the box, and follow the easy instructions to complete the few sections and you're good to go. 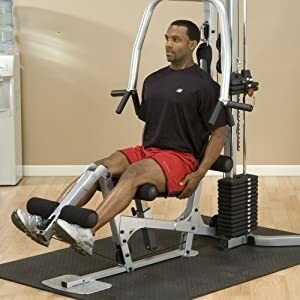 Other home gyms can take all day to put together, with the short assembly time required for the BSG10X you'll be working out while other people are working up a sweat just getting theirs out of the box. There won't be any trouble fitting the Powerline BSG10X Home Gym into your home. 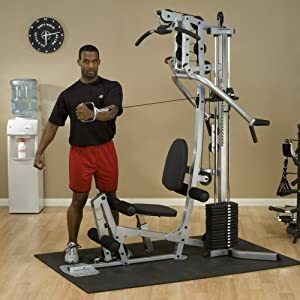 Its straight, single station design puts all of the functions of the gym into one spot, so you won't be shifting, moving around, and getting into position when you move from leg curls to arm curls, chest presses to pec flys or any of the 30 other exercises possible on the Short Assembly Powerline Home Gym. The cables on the Powerline BSG10X are made of high-quality 2000 pound tensile strength cable, and the body frame is tubular steel construction that is durable. It comes with a long, 10-year warranty. You can add even greater flexibility to your home gym experience with an additional tricep rope, and a barbell handle that you can attach to your Powerline BSG10X Home Gym easily and add more workouts. As you advance in your abilities you can even add an additional 50 pounds of weight to the 160 pound weight stack for added resistance. 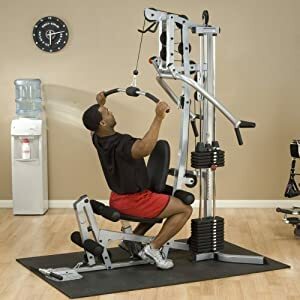 The Powerline BSG10X home gym is made primarily for those who are just starting a home exercise program, and want an easy to use machine with a short assembly time, and fair amount of weights. The 160 pounds provides enough resistance for the average beginner, but is probably too lightweight for more seasoned athletes. While the Powerline BSG10X Home Gym is not a wide, or deep machine, and doesn't take up much floor space, it is tall. So make sure you have plenty of headspace in the area you want to set it up. The company says it needs 6 feet, but most users agree that it really needs roughly 8 feet of height. If you are looking to add a home gym to your life, and don't have a lot of space or a huge budget, the Powerline BSG10X Home Gym, Short Assembly, 160lb Weight Stack is perfect. It is a great entry-level machine that will perform up to expectations for all but the most advanced users, and last for years. The Powerline BSG10X Home Gym qualifies for FREE with Super Saver Shipping at Amazon.